The PPL Course is the first step in pursuing a professional career as a pilot. The course includes the basic ground school (theory), a 100-hour course in the theory of flight, air laws, aircraft general knowledge, aircraft performance, human performance, navigation, radio-telephony, meteorology, and operations; this is followed by a 5-hour flight simulator training; then, a 40-hour actual flight training on a two-seater, single-engine trainer aircraft, focusing on the basics of flying, navigation, flight safety, with ample time for development of the student’s flying skills and proficiency until he is able to fly his first solo and cross-country flights. Upon completion, the student is eligible to apply for a CAAP Private Pilot License. The CPL Course is the next step after completing and securing Private Pilot License. Designed for PPL holders desiring to utilize their flying skills for employment in the airlines, charter or cargo operators and the like, the course includes both CPL ground school (theory), more flight simulator training, 110 hours actual flight training on a CESSNA 150/152 or CESSNA 172 trainer aircraft. 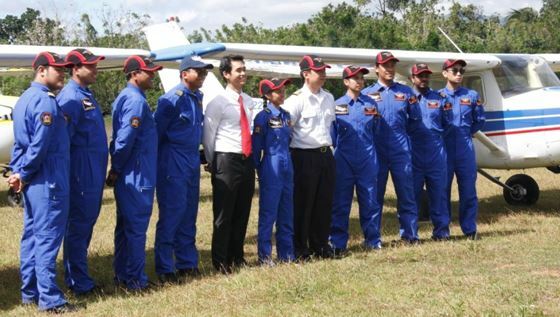 The flight training aims to further hone a pilot’s flying skills through proficiency flights. He will do more cross-country flights. The FI Course enables a CPL holder to teach aspiring student pilots in their flight training for both PPL and CPL. FI students will learn more about the most effective instructing techniques and teaching styles. As Flight Instructors, they will get paid for the flight training as well as build up their own flying hours for future flying jobs. The course includes principles of teaching and actual right-seat flight training. The FOO Course is a short course designed to prepare students for a career which is extremely essential in flight operations of any air operator – that of a Flight Dispatcher. Course topics include principles of flight, navigation, operations, and dispatch resource management. After completion of the course and practical experience through 300 hours of On-the-Job-Training, the graduate is eligible to apply for a CAAP Flight Operations Officer (FOO) License and seek employment as Flight Dispatcher ion any airline or aviation company. The IR Course is aimed at teaching a CPL holder the advanced techniques of flying with the exclusive use of aircraft instruments. This allows a pilot to safely fly in various weather conditions as well as at night. The course includes an abundance of flight simulator training, followed by IR flight training. This rating will be a big boost for those aspiring to work as commercial pilots and later as airline pilots. The ME Rating Course gives pilots an edge in applying for flying jobs since they will have the advantage of proficiency and experience in operating a multi-engine aircraft. The course includes an equipment qualification course (EQC) and actual flight training on our multi-engine aircraft. This 2-year diploma course is designed to prepare a student for employment in aircraft maintenance, repair and overhaul. The AMT student learns all about basic aerodynamics, aircraft engines, aviation materials and processes, engine and airframe inspection, aircraft instrument systems, weight and balance, aircraft structures, lubrication systems, landing gear systems, engine cooling and fire-protection systems, cabin atmosphere control systems, trouble-shooting, etc. SIAA’s aviation workshop and laboratory provides students ample opportunities for hands-on exposure to various aviation systems. 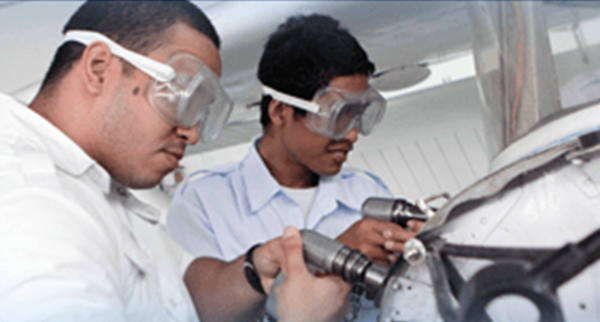 After graduation and gaining practical experience and actual exposure to real aviation environments through On-the-Job-Training (OJT) with established airlines and aviation companies, the student is eligible to apply for a CAAP Airframe and Powerplant (A&P) Mechanic License and prepare for an EASA International Aircraft Mechanic’s License. In this phase of training as part of the Aircraft Maintenance Technician Course (AMT), students gain practical hands-on experience in aircraft ground operations including engine run-up and taxiing or ground movement of aircraft. This greatly helps AMT students in getting the inside feel of running up and taxiing an aircraft, particularly, in building up their confidence in their work as aircraft mechanics. This 2-year diploma course aims to prepare a graduate for future employment with airlines and aviation companies as a world-class Avionics Technician whose work involves installation, test, calibration, and repair of various kinds of electronic communication and navigation equipment onboard an aircraft, like altimeters, compasses, air speed indicators, attitude indicators, turn coordinators, rate of climb indicators, radio communications equipment, direction finders, collision avoidance systems, transponders, back-up systems, auto-pilot systems, gyros, ELTs, etc. After graduation and gaining practical experience through On-the-Job-Training, the student is eligible to apply for CAAP Aircraft Maintenance Specialist (AMS) License. 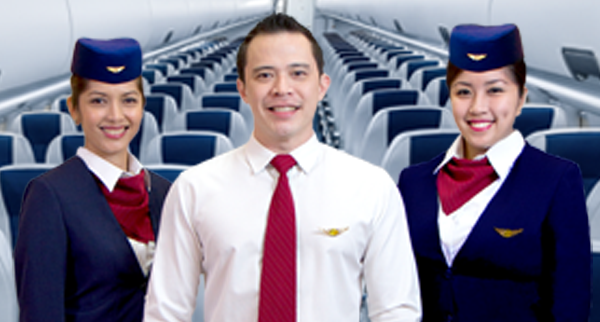 The demand for flight attendants has been growing in line with the demand for pilots worldwide. This course was created to prepare young professionals for duties and responsibilities as flight attendants trained in ensuring safety of passengers in flight. 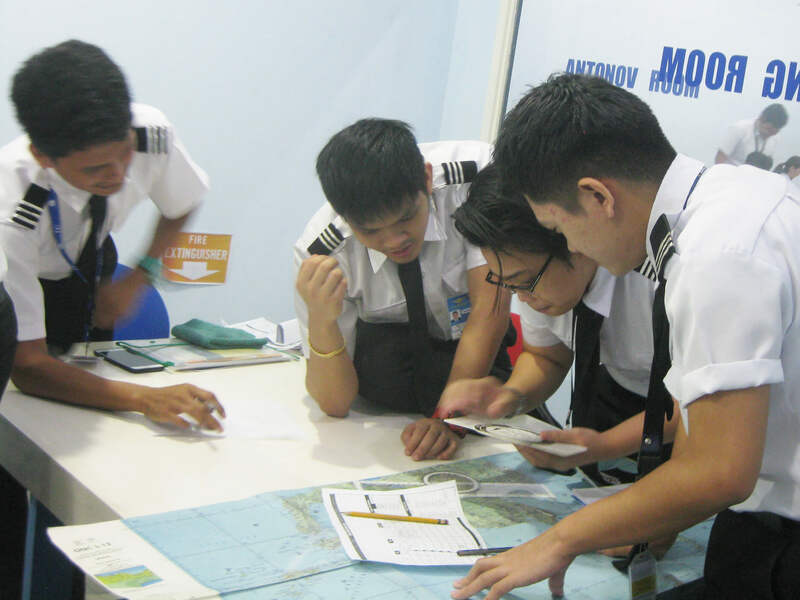 The training covers modules like emergency procedures, personality development, communication skills, passenger service, aircraft familiarization and survival swimming. Upon completion, the graduate is now qualified for employment as a Flight Attendant in an airline and start enjoying the perks of flying. This 2-year diploma course is designed to help students learn the principles in hotel operation, housekeeping, food and beverage services and culinary arts. Students are also given practical experience in our HRS laboratories to apply in simulated hotel environments what they have learned in class. Upon completion, the graduate can now apply for employment in the hotel industry. This 2-year diploma course is designed to help students learn the principles of Tourism and Travel Management, tour-guiding, airline ticketing systems, international and domestic tour operations, tour packaging, etc. Upon completion, the graduate can apply for employment in the local and international travel and tourism industry. 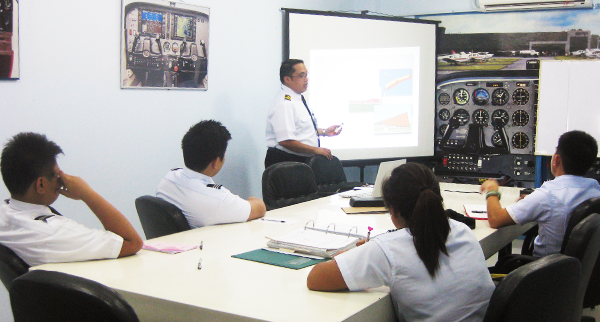 Bachelor of Science in Aviation Engineering Technology (B. S. – AET), a CHED-approved pioneer course. This new 4-year course enables students to earn a degree in aviation maintenance technology that puts together the 2-year Aircraft Maintenance Technology (AMT) and the 2-year Aviation Electronics Technology (AET), or Avionics, Courses in one comprehensive and logical course that SIAA’s brain thrust designed to satisfy the need for a degree course that will produce graduates that are multi-skilled and, therefore, more “marketable” and preferred by aviation employers anywhere. The Course provides students ample time for technical subjects in PowerPlant, Airframe, and Avionics that will enhance their training to be globally competitive in their aviation maintenance careers where specialization is always a must. Graduates of this course will have the skills to maintain any kind of aircraft and thereby assure them of well-paying jobs in airlines and aviation companies the world over. BS-AET graduates can secure professional aviation maintenance licenses, like AMT and AMS from the Civil Aviation Authority of the Philippines (CAAP). Effective School Year 2017 -2018, SIAA will start to offer its latest CHED–approved course, Bachelor of Science in Tourism Management (BSTM), another 4-year degree course that will cater to those desiring to embark on a career in Tourism Management. Subjects, like Principles of Management, Principles of Tourism, Tourism Planning and Development, Events Management, Travel Agency & Resort Management, Tourism Marketing, Transportation, and Foreign Languages, are aimed at providing students the basic and advanced knowledge and skills as tourism professionals. With SIAA’s world-class facilities, including a mock-up travel agency, students of this course will have ample exposure to real-life tourism operations to prepare them for their chosen career. 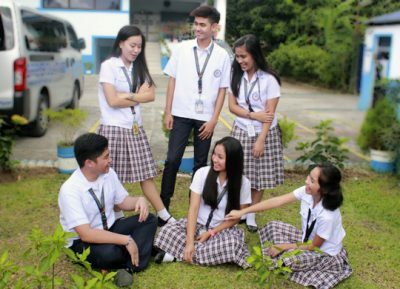 Sapphire International Aviation Academy is now accepting enrollees in all its campuses for the Senior High School Course of the K-to-12 Program of the Department of Education. With the issuance of its Certificates to offer and implement the Pre-School and Senior High School Programs, enrollees will have their choice of the prescribed tracks and strands in preparation for the “Negosyo, Trabaho, Kolegio” thrust of the DepEd. The DepEd has authorized SIAA to offer and implement the Home Economics and Information Technology Strands of the TECH-VOC Track, as well as the General Academics (GA) Strand, Science, Technology, Engineering and Mathematics (STEM) Strand, and the Accountancy, Business and Management (ABM) of the ACADEMIC TRACK. Sapphire Aviation’s facilities have been improved to provide students in these courses the proper exposure and skills necessary for them to fully accomplish the goals of the K-to-12 Program. Please provide us your mobile number if you want us to connect with you via call or sms. All information given will be kept confidentially and will not be shared.